Pita (USA) or pitta (most of the world) also called and less commonly known as pide (Turkish), pita (Serbian), питка (Bulgarian)) is an often round, brown, wheat flatbread made with yeast. 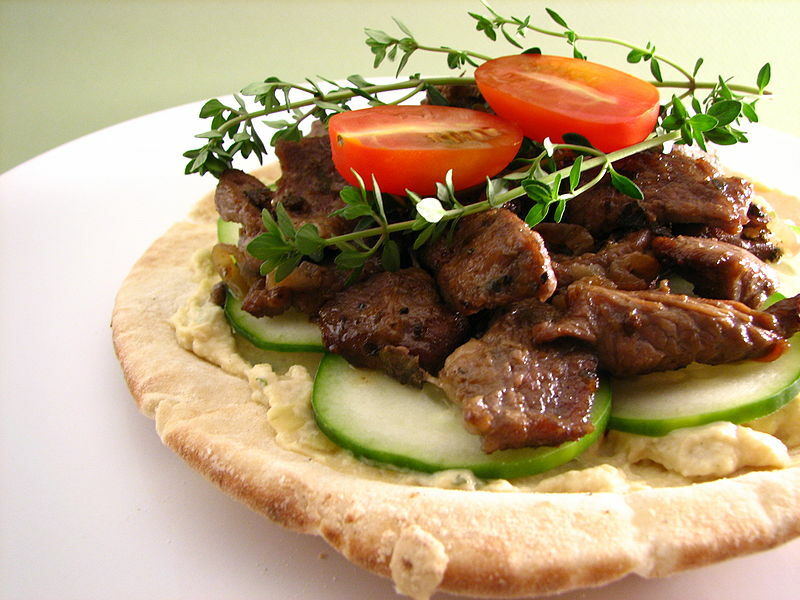 Left: Pita topped with cucumber, hummus, lamb and tomato. Similar to other double-layered flat or pocket breads, pita is traditional in many Middle Eastern and Mediterranean cuisines. It is prevalent from North Africa through the Levant and the Arabian Peninsula, possibly coinciding with either the spread of the Hellenistic world, or that of the Arab expansions under the banner of Islam. Pita is now the western name for the Arabic bread called khubz (ordinary bread), other breads of Arab, Egyptian, or Syrian origin, or kumaj (a Turkish loanword properly meaning a bread cooked in ashes), all baked in a brick oven. It is slightly leavened wheat bread, flat, either round or oval, and variable in size. 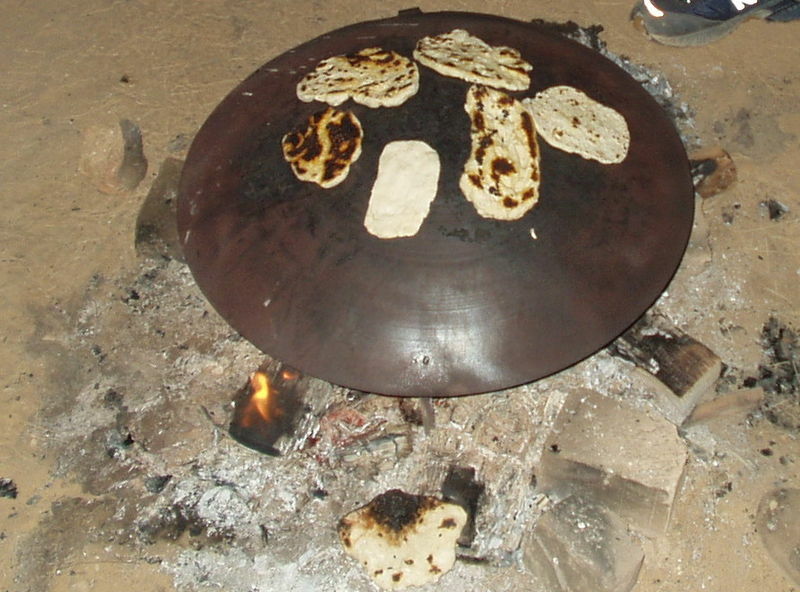 Left: Pita roasted on an outdoor fire. In Greek cuisine, pita may refer to thicker breads made with yeast, for example souvlaki pita. In Cypriot cuisine, pita is made roughly from the same materials as in Greek cuisine but differs in size and shape. The word may also refer to foods using many layers of thin pastry dough of thickness less than 1mm, usually with many different ingredients in between, forming savoury pies such as tyropita and spanakopita, or sweet pies such as baclava. Pita is "bread" in Aramaic. The word spread to Southern Italy as the name of a thin bread. In Northern Italian dialects, pita became pizza, now known primarily as the bearer of savoury toppings but essentially a flat bread. In some parts of southern Italy, there are pastries called pita, which are filled with spicy fruit and nuts. Pita is used to scoop sauces or dips such as hummus and to wrap kebabs, gyros or falafel in the manner of sandwiches. Most pita are baked at high temperatures (850°F or 450°C), causing the flattened rounds of dough to puff up dramatically. When removed from the oven, the layers of baked dough remain separated inside the deflated pita, which allows the bread to be opened into pockets, creating a space for use in various dishes. Much of pita's popularity in the Western world since the 1970s is due to expanded use of the pocket for a type of sandwich. Instead of using pita to scoop foods, people fill the pocket with various ingredients to form a sandwich. These are sometimes called "pita pockets" or "pocket pitas".